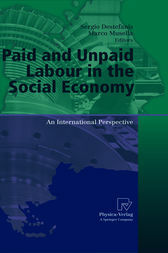 The book provides an up-to-date analytical and empirical treatment of some important interactions between paid and unpaid labour and the social economy. The emphasis on the motivations for paid and unpaid labour, and on how these factors contribute to efficiently providing social services, gives a clear empirical counterpart to the concept of social economy. The book begins with a theoretical perspective on the development and characteristics of paid and unpaid labour in social services. Several empirical analyses, largely using novel data sets, are then provided about these phenomena in Italy, a country which has drawn broad international attention in this field, as well as in other European countries and in the US. Topics of particular interest include: preferences regarding and satisfaction with paid and unpaid labour; ownership structure and risk; ownership structure, remuneration and incentives for paid labour; characteristics of volunteer labour and its relationship with social capital endowment across Italian regions; and a comparative analysis of labour in the nonprofit sector across Europe.